2018 and not electioneering towards the 2019 general elections. 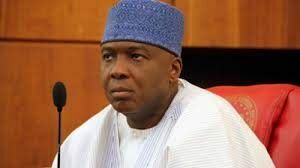 According to Saraki, it is too early for politicking. He noted that 2018 is the last “productive year” before the elections. The Senate President said this in his opening speech as the National Assembly resumed plenary on Monday. He said, “Going into the New Year, I can only wish every one of us the best as we prepare for the task ahead. It is a crucial year. As you all know, this, in all probability, will be the last productive year before we go into the 2019 electioneering period. Not only is there the need to up the ante in terms of productivity, it is important we keep our eyes on the big picture. “Let us not be caught in the political fray before due season. To each and every thing under the sun, it’s own time. This is Nigeria’s time. Let us devote ourselves to its service. “It is therefore imperative that we speed up consideration on the various bills on which legislative work remains outstanding – particularly economic bills. Calling for similar attention are the other parts of the Petroleum Industry Bill related bills still to be passed, namely, the Petroleum Industry Fiscal Bill and the Petroleum Host Community Bill. “It is my appeal to every one of us that our legislative duty to Nigeria and its people, must be uppermost in our minds. We must not allow the upcoming 2019 elections to overshadow our work for the people that elected us – or distract us from that which we are mandated to do by the constitution and the trust reposed in us by the people.